Probably one of the greatest deceptions taking place in our times is the illusion of change, and I’m not just talking about the Obama administration, although it’s definitely a perfect example of it. In order to create the illusion of change, some actual change has to take place, but only on the surface. And it’s true, on the surface, things have changed a lot over the past 100 years: our ways of getting from point A to B, our methods of communicating, or keeping ourselves fed, clothed and entertained. However, no substantial change has taken place in the deep motivations of mankind for our actions, no significant change of heart. We’re still ruled by the same fears and lusts as our ancestors of all times. We just think we are superior because we have changed on the surface. – Or a machine gun instead of a sword, and he may think he’s come a long way. But the end result is the same. That’s what stinks about organized Christianity, also increasingly referred to as “Churchianity:” It totally misses the drift of its supposed Founder. Christianity as it is has become a force for conservatism in this world, when its original Founder was and is the total and absolute opposite. What Jesus was and is and will always represent in this world of phony changes, is total Revolution, and total break with the decaying, sinful ways and attitudes of man, which haven’t changed a bit since Adam and Eve, except that they’ve gotten worse, similar to the condition of a carcass over time. If He is the Life, we are the dead. If He is the Way, we’ve been certainly going in the opposite direction. If He’s the Truth, then most of what you will hear from us, the pride and glory of civilization, is the opposite. Just turn on the TV and count the lies you will hear within 30 minutes. Providing you are still able to discern between truth and lies. You’ll get the drift. What’s worst about the illusion of change is that it makes us think we don’t need any real change. What’s worst about the illusion of health is that it makes us think we don’t need the Doctor. What’s worst about our oh so great perception of ourselves, is that we’ll never realize just how badly we need Somebody to drag us out of our mess. What’s worst about Satan’s puppets acting like all the saviors we ever needed is that we’ll never realize how badly we need Jesus. What’s worst about our blindness is that we actually think we see. Thus is the deadly venom of the illusion of change. Saint John’s visions of the coming leader of the New World Order, commonly referred to as the Antichrist (with reference to his intentions and philosophical inclinations, thus leading to the conclusion that he could not be the Pope), strongly indicate that he will be the culmination of all previous world empires rolled into one, from ancient Egypt to Rome. In other words, even though he may be availing himself of every hi-tech facility thinkable in order to control, enslave and terrorize his global subjects, underneath, it’s going to be the same barbaric and tyrannical spirit as always. The only One actually ever effecting REAL change in the course of history will be Jesus. He may have subtly done so during His first coming. It will be significantly less subtly during the next. The keyword is Bush. What makes the whole matter of trying to save the face of Christianity a Sisyphus task is the fact that George Bush claimed to be a Christian (whether he still does is irrelevant, since his decisions do no longer determine the lives and deaths of millions), and posed as one of Christianity’s most stout defenders and protagonists. I’m just wondering whether we, as Christians, should just willingly accept any type of famous personality and figure of power to speak for all of us, when a little bit of healthy discernment might have easily alarmed us that something about his actions did not jibe with his words (much as is the case with the current President, but without all the embarrassing pseudo-religious ado about it). Now, Christianity already had bad cards in the eyes of a largely brainwashed public who’s been hearing and reading the same old stuff about the crusades, the inquisition, Catholic child abuse, weird Christian cults, etc., etc. for decades, but George Bush was just about the straw that broke the camel’s back. (The camel being Christianity’s image in the world). Anybody with half a brain and enough wits to put two and two together could figure out that if Christianity was the religion that someone like George Bush professed to be a champion of, then it had to be the epitome of evil. I mean, who wants to go to Heaven with the prospect of folks like that up there, right? The other problem being that the vast majority of Christians worldwide swallowed the bait and believed all the books that came out about how George Bush was the man who brought faith into the White House, etc. But as I have stated before, Christians often make the grave mistake of underestimating their Enemy. It would never occur to them to what lengths the Devil goes in order to fool them, not until it’s way too late. By their fruits ye shall know them. And the sad testimony in all this is, that those who don’t share our faith sometimes have greater discernment and a better sense to distinguish between good fruit and a rotter than we do. Anybody can say they’re “saved.” – So did Charles Manson. What greater damage could a Satanist inflict on the body of Christianity than to pretend that He loves Jesus? There are some friends you wouldn’t want to have. Even if they were the President of the United States of America! There used to be a time when I never thought I could have learned anything from a Catholic. Perhaps due to the fact that the sample of “Christianity” I had witnessed in my hometown Catholic church drove me into atheism by the age of 10. But then (quite a few years after having discovered the real Jesus), I came across the writings of the Franciscan Richard Rohr, and found out that God seems to have made exceptions to every rule, and that you can even learn something from a Catholic. Likewise, I was not expecting any mind-blowing experiences to come out of the atheist camp since my latest experiences with countless comments of the defenders of disbelief on our Youtube channels, or having read what some of their supposedly brightest lights like Richard Dawkins or the Zeitgeist people have to say. But then again, you never know when God knocks on your door with a surprise, ready to push over all your carefully construed clichés and mental drawers we keep our fellow humans in. I have found an atheist who is probably a better Christian than I. If I ever would have had and lost anything like it, I would have said “Bruce Sheiman has restored my faith in humanity.” But since I have long ago decided to place my trust in Someone more trustworthy than my own kind, at least I can say, Bruce, thanks for making my day! – And for reminding me of how a real Christian is supposed to act, seeing the good in the folks on the “other side” and coming forward to put in a good word for them, which is probably a closer version of “loving your enemies” than what the majority of Christendom is coming up with nowadays. 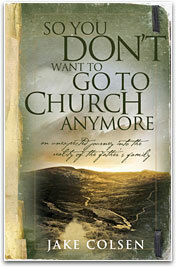 In his book, Bruce Sheiman reminds his readers that while Christianity may not have a snow-white record (as we’re constantly being reminded by those who would love to blast Christianity to hell for its crusades and other crimes of history both past and present), there are nonetheless a lot of decent Christian (or otherwise religious) folks who are doing a lot of good to make this world a better place (and if you ever tried your hand at it, you may know just how tough that attempt can be, especially in the light of the fact that most folks will never give you the credit for it, no matter what you do – just because you’re a believer). Regardless of those culprits and fakes who have abused religion as a cloak for their less than noble purposes (including in very recent history, such as the previous US administration – without saying the present is any better), as a sum, the impact of (true) religion on the world was a good one, even if many folks may not realize it. Mostly, though, he points out something that strikes me as purely divine genius, namely that in our drive to discover what he terms “lowercase truth”–facts and knowledge–we have sacrificed “uppercase truth”–meaning and purpose. In other words, figuring out all the scientific little details about how the universe works may be all fine and good, but not really replace our need for a higher purpose in life than your usual “survival of the fittest” scheme that’s slowly turning our carefully analyzed and dissected planet into living hell for more and more people each day. He observes that our minds are called to something more than a relative truth…and if moral imperatives do not depend on God then they are not absolute and remain relative. – In other words, we’re not really good at kidding ourselves into accepting any counterfeit, fake “goodness” or standard we’re supposed to live by or strive for. The human souls is desperate to find, and unready to settle for anything less than the Real Thing in the long run. Pointing out some of the moral advantages of those Christians and believers who actually did get the point of what their religion’s founder had intended, including their quality to respect humans as created in the image of God instead of just another hoard of highly mutated two-legged mammals who must constantly prove to each other who is the strongest, he contends that the world is actually not any worse off because of religion. One might argue in favor of atheists as civilized and courteous as Mr. Sheiman, that in the light of Jesus’ recommendation to judge a tree by its fruits, the criteria by which He would truly consider a person to be following in His footsteps and worthy of His commendation, regardless of which camp they may profess to belong to (since we live in a world of pretenders, after all), and one way to find out who truly is a “Christian” or a “good person,” we would simply have to look at the way they treat their fellowmen. And in this aspect, Bruce Sheiman has proven himself worthy of a higher commendation than I would be able to presently grant the majority of my fellow believers, and awakens in me the desire that there were more folks like him around, regardless of whether they share my belief or not. Atheists who don’t persecute me for my faith make for a truly refreshing change, including from those fellow-believers who persecute me for the differences between my belief system and theirs. Folks capable of seeing the good in people, even in those from the opposing camp, and even capable of defending them before the world, in my opinion are a greater sample of the kind of love Christ intended for us to live and practice than the attempt to press every- or anyone into our same molds. I’ve said before that maybe Gandhi, being a Hindu, proved himself a better Christian by His actions than probably most Christians during his life-time. 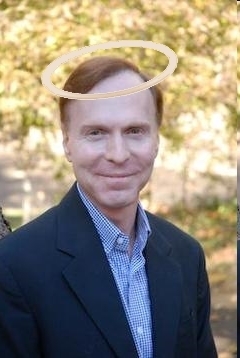 Perhaps Mr. Sheiman, being an atheist (though allegedly considering himself an “aspiring theist”), by his gesture, is putting forth a better Christian example than many of those who claim that label for themselves. We’ve all heard the line “With friends like that, who needs enemies?” Well, with “enemies” like him, we would all soon have a lot more friends. I have certainly learned something from him, and have been reminded of the fact that the One I look up to as my personal Guide and Master also stood out by bridging the gap between enemy camps (such as Jews and Romans), and it makes me long for that quality that His early followers stood out for, which ultimately enabled them to conquer the Roman empire with meekness and love. I must say I do appreciate the work Alex Jones did on his latest two films, “The Obama Deception” and “The Fall of the Republic.” While there are certain elements in those films I would dare to disagree with, the content of valid information in them, in other words, the “truth factor” outweighs the flaws, such as his sometimes slightly overwhelming patriotism that is so common among Americans and seems to indicate that they truly believe that every American is at least ten times better than any citizen of any other country. It’s hard to credibly condemn presidents and the powers behind the New World Order for sending American soldiers off to war, when you’re a victim of one of the principal mindsets yourself that fuels those wars, namely that sort of patriotism and nationalism. Without realizing it, they’re victims of the same media hogwash they rightly say the vast majority has been duped by, although to a lesser extent. But as I say, the information he does put out is significant, and the truth factor does in my opinion outweigh the patriotic hype factors. Without those two films, I’d probably still live under the illusion that Obama was actually an improvement since the Bush administration. By now I know without a doubt that it really doesn’t matter whose administration it is, and things, like the Bible says, are only bound to get worse. As a believer, it felt reassuring to hear Alex give God the credit in his latest film, even if only for the exuberant greatness of his country. At least he does believe in God, unlike other professional exposers of the NWO like David Icke, who seems to subscribe to the doctrines of his pal Brian Desborough, who claims that all religions and the Almighty Himself are an invention of the Illuminati, designed to enslave mankind through religion, a very popular notion that is also embraced by the Zeitgeist movement I wrote about recently. The infiltration of the truth movement by such people is probably the smartest move the Devil could have made, since they’re automatically robbing themselves of the only way out of the mess into which he’s steering the world. That’s probably one factor Alex Jones fails to recognize, too, and just because he seems to believe in God, it would probably be an exaggeration to call him a spiritual man. By failing to see the spiritual background of all these things, though, such as the rise of the NWO, I’m afraid one fails to see a substantial part of the picture. For one thing, while the planned abolition of borders between countries may in terms of industrial independence and political sovereignty be a nightmare for patriotic Americans like Alex Jones, for believers who are aware that the New World Order is only going to be the last, necessary stop before God’s Kingdom will be established, the abolition of borders and national sovereignty has a less significant impact. True Christians believe and know that the coming New World Order will ultimately be headed by the Antichrist, a man, who for the last 3 1/2 years of his life and reign will be completely possessed and controlled by Satan himself, and since Satan is only an imitator and counterfeiter of God, his kingdom will only be a sorry counterfeit of God’s Coming Kingdom, in which borders and national boundaries will be history, and a sad part of it, as well. I’m sorry to disappoint Alex and perhaps millions of others, but I’m fairly convinced that there won’t be anymore red-white-and-blue flag waving folks around in God’s Kingdom, nor patriots of any other kind than those loyal to the Kingdom that has always been not of this present world, of a very different kind, and the difference certainly includes its stance on earthly patriotism (see Hebrews 11). The same applies to the abolition of cash. While the New World Order’s plans to replace paper money with the cashless system the Bible terms “the mark of the Beast” (“the Beast” being a term for the Antichrist) certainly will be truly diabolical, and we strongly advise anyone to refuse to take that mark, it is on the other hand, only yet another way in which the Devil will try to imitate God’s Kingdom, because you can bet your bottom dollar that there won’t be any folks left chasing paper money, and what the Bible calls “filthy lucre” in the Kingdom of God! Ignoring the spiritual factors behind the New World Order and only seeing the people involved in it, is very short-sighted, indeed. The problem is, a lot of the good folks speaking in Alex’ films are of the opinion that if the American people would unite and stand up and rise up against the NWO, then the world could be saved from its fate, but there is unfortunately no way around this darkest chapter of history. That display of blind patriotism will be just as futile as that of the people of Israel during the time of the prophet of Jeremiah, who warned them to submit to the yoke of the king of Babylon (in some ways a proto-type of the Antichrist, since the Bible refers to both as “the king of the north,” although the king of Babylon, Nebucchadnezzar, did in the end turn out to be a good man, which won’t be the case with the AC). Jeremiah was thrown into a dungeon because of his heretical treason, but it changed nothing about the fact that he turned out to be right, after all. Some people who don’t trust Alex Jones accuse him of fulfilling a purpose in the plan of the New World Order cronies: that he will be instrumental in evoking an uprising and violent resistence against the NWO that will give the rulers an excuse to clamp down on them with force, and although I doubt that this would be Alex Jones’ intention, the danger that this is going to happen is quite real. Physical, armed resistance against the NWO will be just as futile as the efforts of Jewish zealots during the Roman occupation of Judea, which was totally crushed. As I wrote in my last entry, one of the reasons the Jews rejected Jesus was because they had been hoping for a messiah that was going to liberate them from Roman occupation. But Jesus actually extended His compassion to Romans as well, as well as Samaritans, which were despised by the Jews, and it seemed that He was announcing that God was going to extend His pact to any heathen that would accept His sacrifice, which is in effect what happened. The problem is that if you think that you and your country or people are so good you’re just about perfect, and the only liberation you need is from the physical oppression of those who are making you pay taxes, then you wind up shouting “crucify Him!” at the one who indicates that you have a bigger problem, which you need to get rid off first. Jesus clearly stated that the yoke of sin that even the seemingly perfect Jewish people were under was something much more serious and warranted greater attention than liberation from the Romans. He would deal with the Roman empire later, just as He will with the upcoming New World Order, be assured, but what you need to be liberated from first of all, is your sins. You need to avail yourself of the only exit and way out of this present matrix by accepting the blood of Jesus Christ as remission from the one thing that will hold you captive in a stronger grip than any physical oppressor could. Why? Because as good as you may think you are, there is no guarantee on God’s earth that you would do any better if you were in charge, unless you heart has been supernaturally changed by the grace of God, and you have allowed Him to replace your own sinful, selfish and carnal nature by the new creature Christ can and will make out of you, if you let Him. One of the major issues about this present life, as far as God is concerned, is the issue of flesh versus spirit. What will you place your bet on? Which will you put your money on? Will you put your hopes in your own arm of the flesh (and remember, your brain is just another chunk of that flesh, and your own smartness won’t save you, either)? Or do you recognize that there is something Greater at work, even if invisibly, behind the scenes, that is going to empower you to truly rise above all the evils in this world, just as It- or He – empowered all the martyrs throughout history? Do you think that the worst that could possibly happen to you is your physical death, and the end of your fleshly existence is going to be The End, period? It all depends on which you’ll choose to put your trust in: God’s Promises of eternal life in a better world than even your oh-so-beloved America, or your own wit and strength to save you. In the language of our times that spells persecution. Persecution of all those that God deems righteous. The only qualification to meet that criteria is having accepted the sacrifice of the Righteous One, Whom the Western World refers to as Jesus the Christ, and whom His original Mideastern followers have called Yashua, the Messiah. If the Devil is a reality (and if you look around, you can’t deny the evidence), and all that is written about him in the Scripture is a reality, then those Scriptures that prophesy his incarnation in one final world ruler at the end of the world as we know it must also be a reality. All that I have observed over the past 4 decades has gradually built up a perception of that reality, which by now – as unfortunately as it may be considered by some – has become unshakable. The “war against the saints” has begun a while ago, even if it may have been duped different things. If there was ever a period in which it seemed as if all those Bible prophecies were false, and Christianity was actually becoming more and more popular and recognized by society, I think that period has just about come to an end. 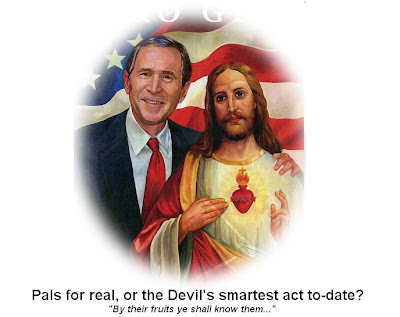 Satan’s had his heroes in his war against Christ since the beginning of time, and probably some of his greatest progress in the past decade has been achieved by the Bush administration. Just the fact that this most un-popular of all presidencies posed as “Christian,” (and by now there has emerged sufficient evidence that it was not genuinely so), was a genius strategic act of the anti-christ forces that have cost Christendom at least 8 points on a popularity scale from 1 to 10 (and it wasn’t at 10 when the count started). It’s not as if the tactic was entirely new. After all, kingdoms and empires and those who ruled them – nowadays we call them politicians – have often posed as “Christians” while pursuing their true goals of power by means of eliminating the other side (not seldom the true believers), which is what Jesus referred to when He prophesied, “The time cometh, that whosoever killeth you will think that he doeth God service” (John 16:22). Some of them must have genuinely thought that they fought on the right side, but they were genuinely and sincerely wrong. Now with Obama”in power” (or at least filling the puppet post of pretense of power) the rest of the world is heaving a sigh of relief that America has come back to her senses, away from all that Christian fanaticism that surely must have been the root of all evils and woes in this world. A new age of reason has been ushered in, soon to enlighten those who wish to be “enlightened” and to eliminate those who refuse to be. You can make your own guess on which side of that war your government is fighting, your country’s school system or the scientific community, the mainstream media, or such day-to-day conveniences as Google, for that matter. And while you’re at it… your employers?… Yourself? Unfortunately, many of those supposedly fighting for the side of Christ in this battle aren’t actively participating, because they believe that Christ will whisk them away from the battle field before the battle even starts. The battle will come over them unexpectedly and virtually catch them with their pants down, unprepared, unexperienced in wielding the spiritual weaponry of faith and the Word of God, and weakened by countless temptations and distractions brought on them by the gods in whose temples they actually spent most of their time: Mammon (god of wealth), Mars (god of war), Bacchus (god of addictions) and the likes. Instead of helping to strengthen and arm their brothers and sisters around the world, a lot of supposed “soldiers of the cross” seek to enrich themselves by fleecing the sheep instead of feeding them, as Ezekiel prophesied. What would Jesus do if He came into the modern temples of today? Would He act any differently than He did when He chased out those who had made a market hall of His Father’s house? So, where are the true shepherds, Whom the Lord will find feeding His sheep when He comes? May God have mercy and replace the love of money in our hearts with love for the lost. No physical wall you will have erected around yourself will protect you from the war on the saints when it will break loose, only real faith. It’s the only currency that will survive the purging fires that are going to sweep across the world. At first I felt a little bad about the line in my “Farewell Mr. President” song to Bush, after Obama got elected, that says, “So, come on get down off your thrown, make room for yet another creep,” thinking it was perhaps a little exaggerated ad out of place. After all, there seemed to be genuine signals that Obama was bringing about positive changes indeed, like the executive order to close down Guantanamo. Well, after having just watched only the first half of “The Obama Deception,” I humbly admit that my wife had a better sense of discernment than I did, and that “creep” seems to have been, rather, a compliment. I never would have thought it possible that she was right when she said, “But what if he’s worse than Bush?” – Impossible, I thought. 111 What About Yin and Yang? One philosophy that certainly seems to become more popular than the “We make ya dead” type of Christianity that has given the Cause of Christ a bitter by-taste ever since the crusades, and turned out specially bad latest since the Bush administration, is the Zen-Buddhist philosophy of Yin and Yang. The symbol of Yin and Yang is rapidly becoming more popular than the cross, especially among young people. After all, Buddhists aren’t known for having caused a fraction of the damage “Christians” are still perpetrating worldwide every day. So, who can blame them? Who can blame them for believing that good and evil must be equally strong, and that evil must necessarily stick around forever in order to keep the “proper balance” in nature and all things? After all, it’s plainly evident by looking all around us that there are 2 sides to nearly everything. There is a good and a bad side to even all apparently bad things, as well as to seemingly purely good things. Even water, as necessary as it is to make all life possible, can also drown you and bring death. Too much air can pop the balloon or – in the form of a storm – tear down your house. So, what’s up with all that Yin and Yang, good and evil stuff, Jesus? Looks like You’re pretty speechless now, huh? Could it be that we just ruined Your show and exposed Your dark little secret that evil is just as strong as You are, and that it’s going to hang around forever? Well, it may seem that way, because we’ve never seen anything else and never experienced anything different. But according to the Bible, there was a couple of folks who did. And coincidentally, they introduced this whole good and evil stuff. When God created Adam and Eve (a fairy tale, you say? Well, we’ll see, won’t we? ), and the whole caboodle of creation was done, He saw that it was good! In fact, very good. Nothing evil or bad about it. Yet. But wouldn’t you know it? As much as we’re always craving for something new to consume and try out, even the two happiest and most perfect folks who ever lived turned out not to be perfectly happy with what they had, even though it was perfectly good. That’s what advertisement will do to you. Some legged serpent came strutting along, obviously possessed by the greatest advertiser of all times, and broke the news to Eve that there was a product around that she hadn’t consumed yet: the notorious fruit of the tree of the knowledge of good and evil! The price: one tiny little disobedience, since God had made one single little rule in order to keep happiness in Eden afloat: No munching off that one tree! The reason – retrospectively – becomes obvious: If you already know good, and it’s perfectly perfect and good, who the heck would want to know evil? Well, Eve did. And so we all probably would have. After all, who’s ever been able to resist advertisement? Well, they probably wished they had, after they ate that darn piece of forbidden fruit (which by the way was NOT an apple)! But that wasn’t God plan. Adam and Eve were still supposed to become Mama and Papa and Grandma and Gramps of us all. But life wasn’t half the fun it used to be before the knowledge of good and evil had entered the land! The knowledge of good had perfectly sufficed, as far as happiness goes, but then, God had a little lesson to teach the universe, and it wouldn’t last billions of years, either. Just – roughly – 7,000. And thus were born – roughly around the same time as Cain and Abel, coincidentally – the twin bros Yin and Yang, who have been wreaking havoc around this place ever since. But – and that’s where some folks are mistaken – not forever! Just as life was perfectly possible and enjoyable without evil, so it will be again, and next time without any interruptions (except for a minor hiccup a little further on in history, but that’s another story)! While the current laws of nature and the dog eat dog scenario of the “survival of the fittest” may seem to tell a different story, and even lead us to believe that man isn’t much more than a slightly overly mutated animal himself, it takes a little bit of faith in a shred of information from outside the Yin and Yang matrix (namely the Word of God), to reveal to us that circumstances haven’t been and won’t be always the same. There have been “changes in the Matrix” before, introducing the Yin and Yang program (aka Good and Evil), after the first human couple rejected the original “All Is Good” System, bringing into our reality all the deficiencies riding along on evil’s coattail, such as death, suffering, wars, etc. But God (- the Architect with better intentions than the one we know from the “Matrix” trilogy -) has promised to push the “reset” button in the near future, which will restore the original operating system, which will make evil – once again -obsolete.